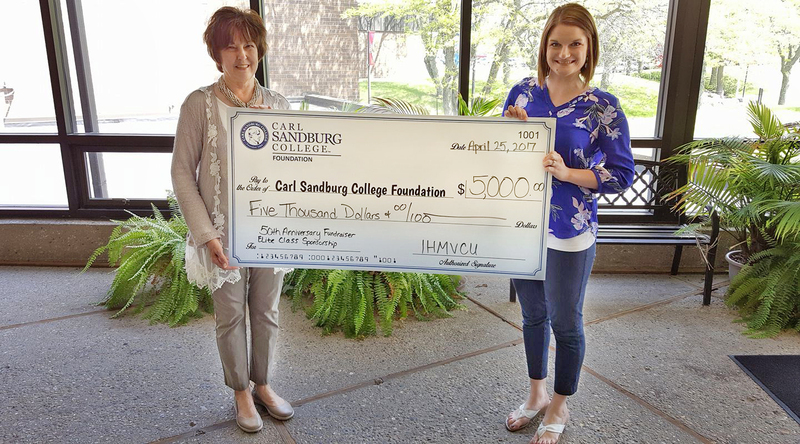 IH Mississippi Valley Credit Union has made a $5,000 donation to the Carl Sandburg College Foundation to become the Elite Class sponsor for the Foundation’s upcoming 50th Anniversary Celebration. IHMVCU’s contribution for the 50th Anniversary Celebration on Sept. 16 at Yemm Ford in Galesburg is a major stride in helping the Sandburg Foundation reach its goal of raising $100,000 toward its annual fund through the Vitale Challenge Campaign. The campaign kicked off last September with Sandburg Foundation Board member Andrea Vitale making a $5,000 contribution, and she pledged to donate an additional $5,000 if $100,000 was raised by Sept. 30, 2017. The 50thAnniversary Celebration is a community-wide event to raise the final dollars needed to reach that goal. During this special one-time fundraiser in conjunction with Sandburg’s golden anniversary, 50 trips will be auctioned over the course of the evening. Forty-five — including a trip and $1,000 gift card to Good’s Furniture; an overnight stay and dinner at Jumer’s Casino & Hotel; and trips to Chicago — will be given away in a silent auction. Five other trips will be auctioned off live, including a weeklong stay in Hawaii. The celebration will also include food from the Packinghouse Dining Company and other fantastic fundraising opportunities. Proceeds from the celebration will go toward the Sandburg Foundation’s annual fund, which assists with and addresses various needs throughout the College such as mini-grants for faculty and staff; emergency funds for students in need through loans and grants; scholarship funds; and much more. Tickets and other sponsorship opportunities for the 50th Anniversary Celebration are still available. To purchase your ticket, become a sponsor or contribute to the campaign, contact Stephanie Hilten, director of advancement, at 309.341.5349 or shilten@sandburg.edu. Chris Ryner (left), business development officer at IH Mississippi Valley Credit Union, presents a $5,000 check to Stephanie Hilten, director of advancement at Carl Sandburg College. The donation from IHMVCU made it the Elite Class sponsor for Sandburg’s upcoming 50th Anniversary Celebration fundraiser.